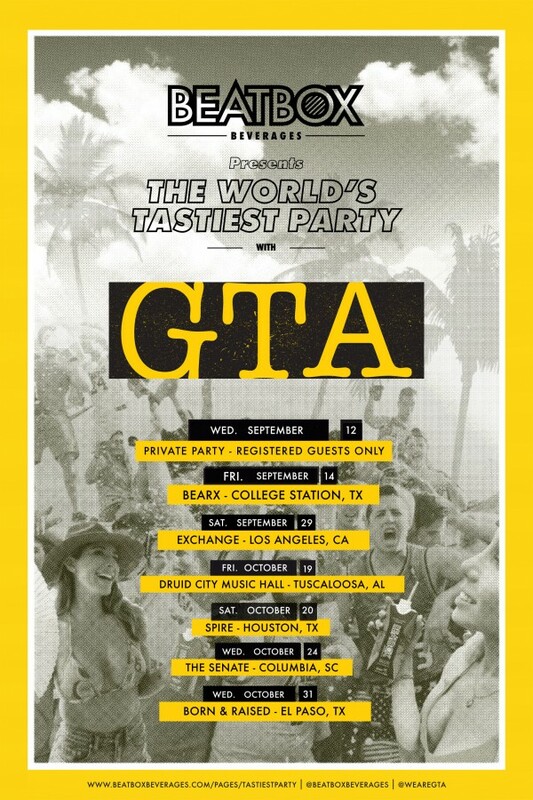 BeatBox Beverages is proud to announce their first national event series, “The World’s Tastiest Party” with GTA. The GTA music duo, consists of Julio Mejia and Matt Toth, two electro house and hip-hop producers from Miami. The series will kick off in the brand’s hometown of Austin, TX and proceed to cities around the U.S. like Columbia, South Carolina, Tuscaloosa, Alabama, and many others before finishing up in El Paso, Texas October 31st. “This BeatBox event series, presents the unique opportunity for BeatBox and GTA to connect with fans in their element, make memories, and tell stories through the content everyone creates,” -- Nick Greeninger, Director of Marketing. We invite you to join us as we make our way across the country with GTA. For more information and tickets please visit https://beatboxbeverages.com. The tour's remaining schedule can be found below with upcoming stops scheduled through October.